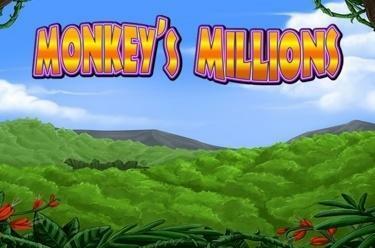 Play Monkeyʼs Millions online for free now! Apes, parrots and all types of wild animals - it’s all going on with Monkeyʼs Millions! Lots of Twists are lurking in the undergrowth, just waiting for the right moment to zip into your player account. We hope you are accustomed to the tropical temperatures: 3 Bonus Games, a Big Win Feature and the Jungle Jackpot will bring you out in a sweat! Land 5 identical symbols along a win line and clear up! Your winning patters run from left to right along the reels. To win recreate the win lines with several matching symbols from the left without interruption! The WILD symbol substitutes all other symbol except the bonus symbols! 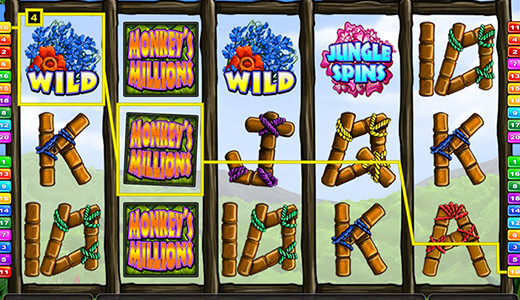 Jungle Spins (Free Spins): 3 'Jungle Spins' symbols on the second, third and fourth reels win 5 Free Games - in the Free Game 5 Banana symbols along a win line crack the Jungle Jackpot! Big Win From a certain win amount (regular game: total bet x 10, Jungle Spins: Total bet x 20) you can get a random one-time win (Big Win). Parrot Bonus: 3, 4 or 5 Parrot Symbols win the Parrot Bonus. Select a parrot to win a random multiplier. Your total current stake will be multiplied by this value. Monkey Bonus: 3, 4 or 5 Monkey Symbols win the Monkey Bonus. You play on 3 reels. In the display above, each symbol - analogous to the reels - is listed as a triple combination. Click on ‘Start’ to spin the reels. Depending on the combination, the corresponding symbols light up on the display. 3 similar, lit up symbols win a multiplier. All multiplier wins are added together. If 3 golden bananas light up you win the Jungle Jackpot! This feature will continue until the 3 banana peels below the reels are complete.